During my Premium trial, I noticed many "RTProtectionDaem" file system permission deny errors in the Console app when running on Mojave. After that all the Console errors stopped, and I also noticed a reduction in CPU usage for RTProtectionDaemon. I couldn't find any info regarding this in the user manual or on the forums, so I just thought I'd post it in case it might help anyone else is seeing issues with Premium on Mojave. Malwarebytes for Mac is slightly impacted by Mojave's new privacy protections. 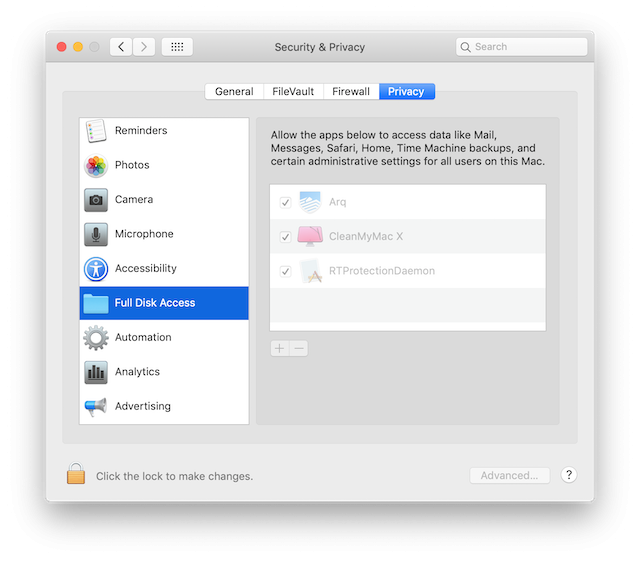 The software needs to be able to scan for Safari extensions, which are in a protected folder in Mojave. Unfortunately, Mojave does not trigger a permission request alert when a background process (like RTProtectionDaemon) tries to access such resources. This means that it will throw errors in the logs. The good news is that this doesn't affect detections from a practical standpoint. Mojave only allows certain verified Safari extensions to load from Safari's extensions folder. This means that the adware extensions can no longer load from this protected folder, so there should be nothing to detect there on Mojave. Still, it can't hurt to add RTProtectionDaemon to the Full Disk Access list, and the only data Malwarebytes for Mac will use that permission to look at is Safari extensions. It will not look at things like your e-mail messages, browsing history, etc. I haven't seen any other reports of performance issues caused by this issue, but we'll look into that. and that's only 15 seconds' worth, so it seemed reasonable to assume it might impact performance with that high of an error rate. May it have negative implications for privacy but not only? Adding the Malwarebytes app won't actually help, so I don't recommend adding it. You would need to add RTProtectionDaemon, but you can't navigate there from the dialog you get by pressing the + button. Then click Go. This will reveal the RTProtectionDaemon app in the Finder. Then, in System Preferences -> Security & Privacy -> Privacy -> Full Disk Access, click the padlock at the bottom left of the window to unlock the preferences, then drag the RTProtectionDaemon app into the list. That should add it. One question: but the manual / scheduled scanning process haven't the same access problems? I would like to point out that the Titanium Software Maintenance software deletes this Malwarebytes setting in the privacy section of macOS. I do not know if it is caused by the software in question, Malwarebytes or Apple. I have always found it useful for occasional system maintenance. If it is not recommended to please let me know. The edit prompt is only available for a short time after you submit the post, so it probably expired before you discovered your error. I had already pointed out that the Titanium Software Maintenance software deletes this Malwarebytes setting (FULL ACCESS TO DISK IN MOJAVE PRIVACY SETTING). I have always found it useful for occasional system maintenance. until now nobody has been able to give me an explanation about it. Thanks to anyone who will explain the reasons (and if there are any options that it is better not to use). I'm away from my computer, so can’t help diagnose this at present, but would be helpful if you can determine exactly which of those actions is clearing RTProtection. I suspect the staff will need to contact Titanium to resolve. Unfortunately, Titanium, which I contacted, tried to download Malwarebytes, but was not willing to purchase the Premium version and therefore did not perform any tests. I hope that any contacts between the two software houses can solve the problem. I'm waiting for an answer (hoping that the email will not be trashed), but if Thomas Reed could take a look at the problem, maybe he would solve a lot sooner. If all options are selected except that the setting is not changed. Thanks for running that down. My experience with reconstructing Launch Services using any method has been mixed. Once in awhile it will solve the issue I have, but often it just creates new ones. I strongly suspect that this is an Apple bug and that the Maintenance Utility is simply issuing a Terminal command to run the lsregister process. I don't understand why it is removing the RTProtection daemon. Hopefully the developers can figure this one out. I'm glad this was resolved. I'm curious, though... what functionality does Maintenance provide that you feel is necessary? Modern macOS is pretty good at maintaining itself, and I don't generally recommend the use of these kinds of tools, except perhaps in very specific troubleshooting situations. I definitely wouldn't recommend it as something to run regularly. Rebuilding the launch services database, for example, should not be done unless you're having a problem like having the same app appear multiple times in the Open With menu, or having the wrong app open for a particular file or URL. I used it a lot in the past, before receiving advice from you, also because I came from the Windows world where this type of maintenance was necessary not to say fundamental. Now it was a pure curiosity to understand what was due to the disappearance of the above privacy setting. Now I leave the system to keep alone, the only thing that I still use with an app that I created with Automator is cleaning CACHE FLUSH DNS so you do not have to look for the command from the terminal that is more complex to remember than that of MS Windows. I think the cause must have been rebuilding launch services, but I'd view that as a potential bug in macOS. If you have given full disk access to security software, malware that managed to get itself loaded from one of those protected locations could potentially remove that access from the security software to prevent itself from being detected. Of course, that would require the malware to gain that access in the first place, which means this is a bit of a stretch, and it's probably not actually a real-world issue. As I said above, once satisfied the curiosity about the reason for canceling the RTProtectionDaemon privacy setting, I have uninstalled the MAINTENANCE application of Titanium Software with the uninstaller integrated into the app, leaving macOS to self-maintenance by running each single plus the FLUSH of the CACHE DNS. You shouldn't even need to flush the DNS cache unless you're having a problem... and if you're having frequent problems with the DNS cache, there's some kind of problem that needs to be solved, for which flushing the cache is purely a temporary fix. In reality I have no problem with the CACHE DNS. as an anti-tracking measure by websites after visiting sites of the means of payment. DNS Cache is used to speed up your browsing experience by saving URL translation information locally, so you don't have to keep asking for it on a remote DNS server. It does contain a list of sites you recently visited, but unless you have some sort of malware on your computer that can harvest that information and send it somewhere, it can't possibly be used to track. And I seriously doubt that any malware developer would find that information useful compared to other information on your Mac. You might find a better defense against tracking cookies is the Ghostery extention.